When work and passion intersect, it is a beautiful thing. It all started two years ago when Blake Wood ran over my head in a criterium. To be fair, the whole thing was my fault, and he was a real sport about it, especially since he had to replace one of the shifters on his bike after it became impaled in the perfectly manicured lawn at the formal garden loop. A while later, I started training with Blake, who in addition to being a bike racer and head-runner-overer, is a darn fine personal trainer with a unique insight into the needs of cyclists and other endurance athletes. I am quite sure he gets perverse pleasure from paying me back in spades at our 6am workouts. 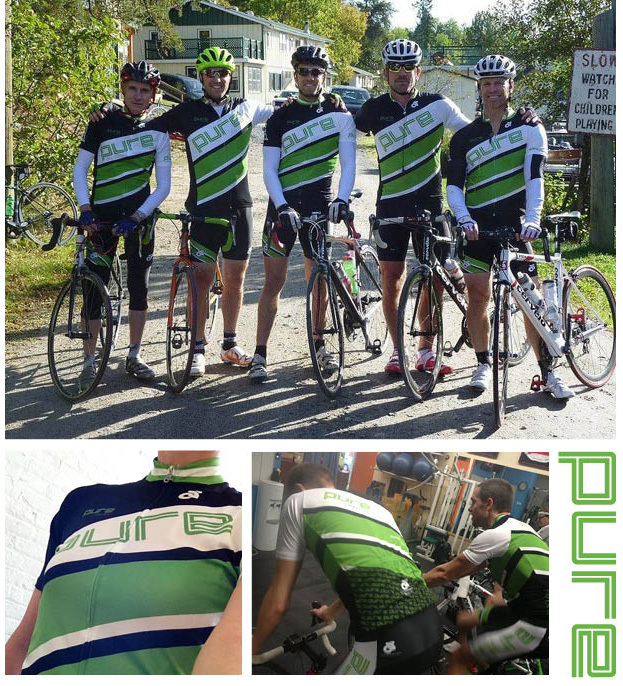 Early in the new year, Blake and four business partners are launching a new gym concept called Pure Lifestyle. I was fortunate enough to work with them to create a new brand for the business, including a pending website, event tent, print materials, and most importantly, this super-sweet bike kit. Given the media around cycling these days, I feel particularly smug when I wear it. In fact, I am so disgusted by cycling’s bad rap that I have committed myself to the regular use of performance inhibiting substances – like jello shooters, for example. While it is neither dark, nor red, nor does it have a rooster emblazoned on the back – the Pure kit does have a uniquely bold and graphic look, which is particularly dramatic when worn by multiple riders of the superior quality shown in the photos above. JF has taken it to a whole new level by sporting matching bar tape and stealing a helmet from one of the Movistar guys. Chapeau Jean-François! Chapeau. Ah Rennie, I’m going to need a bigger helmet! Thank you so much! I’m sure Blake would happily hook your up when he puts in the next order. You would look smashing in Pure! By the way, it would be fun to do a post about nutrition sometime! Maybe you could offer some insight into what we should and should not be putting in our mouths. Thank you very much for the great article! I am still sorry about running over your head a couple years ago! You have really designed the essence of what I believe to be a Pure Lifestyle !!! Thanks again for the great kit!! !